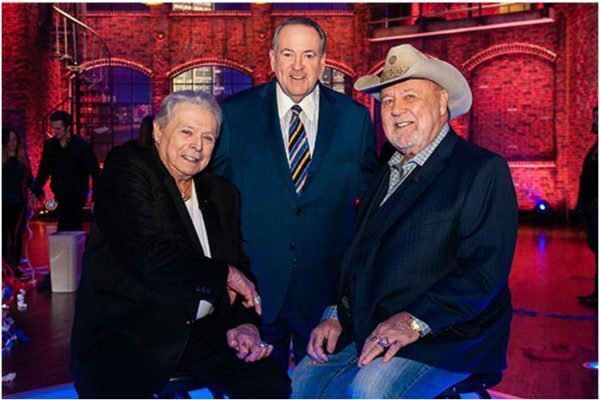 Tune-In Alert: Mickey Gilley and Johnny Lee To Perform As Musical Guests on HUCKABEE | 2911 Enterprises, Inc.
NASHVILLE, Tenn. – Viewers can catch legendary country artists Mickey Gilley and Johnny Lee performing on TBN’s ‘Huckabee’ Sat., Dec. 29 at 8/7c and again on Sunday at the same time. You can find your local TBN channel here or stream the broadcast live here. The two legends will kick off their 2019 “Urban Cowboy Reunion” tour on Jan. 12 in Hinton, Okla. at the Sugar Creek Casino. For the latest on Gilley, keep with him on his website at gilleys.com. For updates on Johnny Lee, you can find him at thejohnnyleemusic.com. Mike Huckabee welcomes top newsmakers and guests from the world of entertainment and culture as well as innovators from business, education and science. All this and great music performances along with stories of everyday Americans who inspire make this a must watch show. For more information visit tbn.org/huckabee.